With the rain falling yet again it is with a thankful heart that we can at last say our harvest is over. The last of the big bale silage was wrapped this morning before the heavens opened. 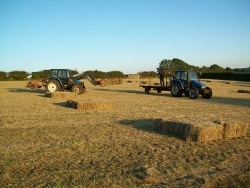 We have managed to make enough silage for the winter period and have some small bale hay which gives us some flexibility when feeding small groups of cattle in the autumn, the odd sick animal or if we get caught with snow this winter we can carry a small bale on our backs to stranded animals. Big bales are easily moved as long as you can use a tractor not always the case in heavy snow or very icy conditions! What a different year this has been for generating electricity. We have rarely had to use our small turbine as the river has hardly ever dropped to what is normally consider summer flow levels since March’s heat-wave! Apart from generating all that renewable energy the flow levels have obviously had an effect on the river’s inhabitants. 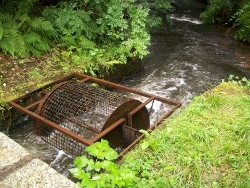 We have already put our fish wheel in to guide the adult salmon past us as they travel up to the head waters to spawn. The beginning of August is really early for this stretch of river to have salmon and sea trout running, but they are there, and going past us safely in the heavy fast flowing river water.